The Fader EA is a trading algorithm that after the completion of the first spike phase (initial spike) places a Limit or Market Order that trades against the spike. 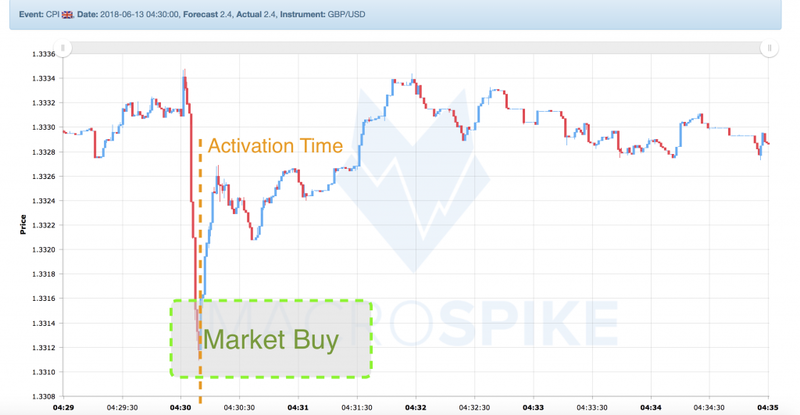 For example, if the initial reaction of the market towards a news announcement is up, then the EA will place a SELL order on your platform. 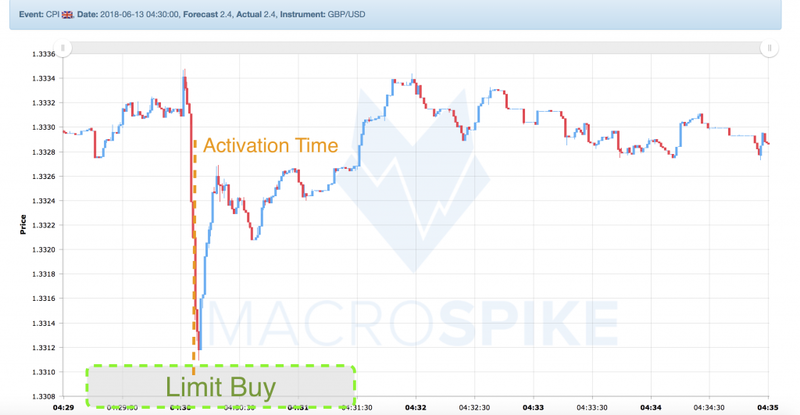 After receiving the signal by the newsfeed the EA has a waiting period where it remains dormant (Activation Time) to let the market complete the initial spike before taking the position against it. Then, either by using price levels or spike sizes it will define a Fade Zone, a price area where it places the counter trade. We define as Fade Zone a support or resistance zone that we deem as favourable to enter the market against the spike. 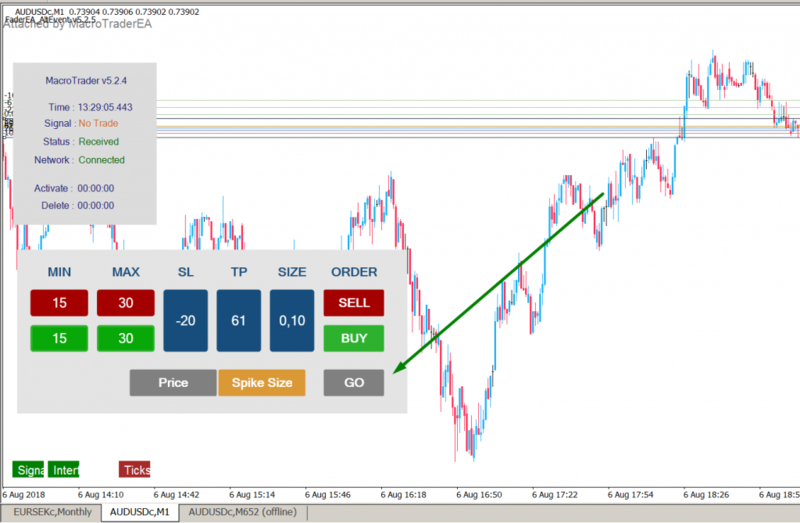 Fade Zone are always a price range with a minimum and a maximum level. They are called MinEntry and MaxEntry. In the picture below you can see our example Fade Zone. 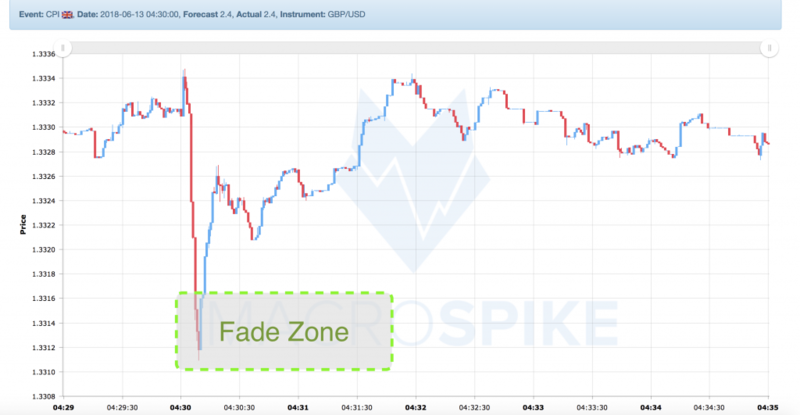 When defining Fade Zones, the user can either use absolute price levels or as spike sizes to define the Fade Zone. If the user chooses to use absolute prices he will define a price range for the instrument he trades. In our example, that would be a MinEntry of 1.3316 and a MaxEntry of 1.3310. If the user chooses to use spike sizes he will define the price range as the distance from the spike start. The spike start in our example is 1.3331 so for the fade zone to be as displayed in the example the MinEntry would be 15 and MaxEntry 21. How does the Fader EA place the Order? The Fader EA will apply different mechanics for the order placement depending on where the price is in relation to Min and MaxEntry when the order is activated at Activate Time. If the price is not at the start of the Fade Zone (in the case of the Sell signal above the fade zone) once the EA is activated, we will place a Limit Order against the movement (in our case a Buy Limit) at the start of the Fade zone. If the price is inside the Fade Zone once the EA is activated (that is between the between the minimum and the maximum) you will enter with a Market Order against the movement. 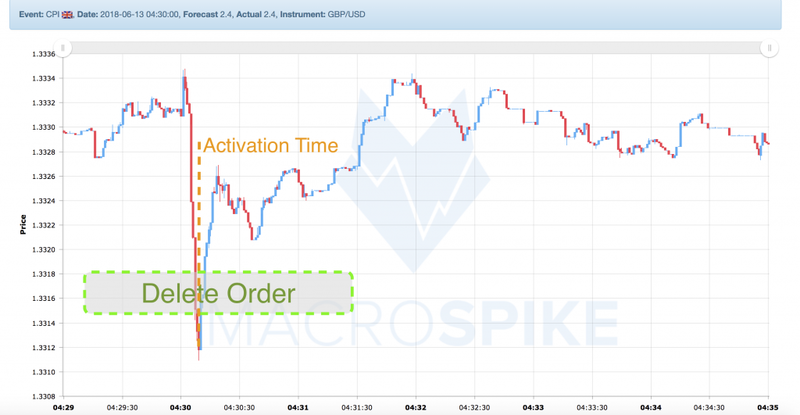 If the price reached MinEntry before Activate Time but moved out of the Fade Zone and is out of the Fade Zone at Activate Time, the EA will will place a Limit order at MinEntry. That is, as long as the MaxR% is not surpassed. If the price moves beyond the maximum of the Fade Zone (lower than the End of the Fade Zone) before the Activate Time timer has ended the EA will delete the order. Therefore, MaxEntry has to be chosen carefully, as a move beyond will immediately stop the execution of any order. You can set both MinEntry, as well as MaxEntry to 0. If you set MinEntry to 0, the EA will place a Market Order at activate time as long as the MaxEntry level is not surpassed. If you set MaxEntry to 0 the EA will place a market order as long as MinEntry has surpassed. After Delete Time timer has passed the EA will switch into dormant mode. It can be reactivated by clicking the GO button on the interface. After reactivation, the EA will place orders as if there was no DeleteTime and no Min and MaxTrigger. Depending on the waiting time between the signal and the initiation of the EA (Activation Time) and the distance of minimum and maximum price levels (Fade Zone), it can be designed to take advantage of either short-term imbalances for scalping profits, as well as use overextensions into S/R Levels as a favourable entry point into medium-term intra-day trades.